"The challenge for us is to actually educate our ’patrollers’ and to help educate the public. By doing that, that helps our goal of making a better nation," said ABS-CBN News and Current Affairs head Maria Ressa (not in photo) about enhancing the power of citizen journalism in the country. The WAR (wireless audience response) room of ABS-CBN contains touchscreen TV screens (top frame). As early as 2009, ABS-CBN’s News and Public Affairs has been advocating for the active participation of the public in information dissemination. This has been its primary goal since it launched "Boto Mo, i-Patrol Mo: Ako ang Simula," a program specifically made for the 2010 elections. Aside from the news gathered by its field reporters, ABS-CBN has also been featuring newsworthy, election-related feeds from ordinary people, who are now called "citizen journalists." The ABS-CBN News team would like to highlight these items on their special election coverage on May 10 by using a multi-platform and cutting-edge system of TV reporting. 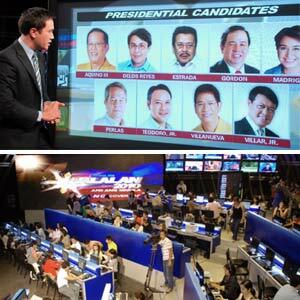 The Kapamilya Network will use touchscreen monitors to pull up information (from social networking sites such as Facebook and Twitter) on the candidates while a report progresses. 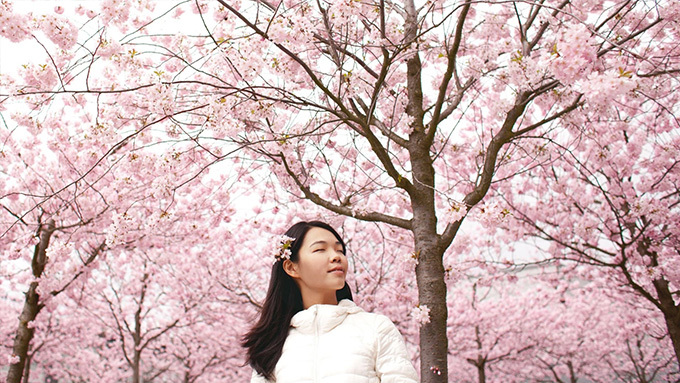 Through the use of new broadcast technology called "augmented reality," it will combine computer-generated imagery with live video as well as reports from field reporters in real time. "It’s not only the tri-media. We’re aiming to do more than that. We want to break the wall between virtual and real," ABS-CBN News and Current Affairs head Maria Ressa pointed out to members of the press who visited their WAR (wireless audience response) room inside the ABS-CBN compound in Quezon City. She also hoped that the newest additions in their newsroom would set the trend after the elections. "This is the tipping point for us journalists with citizen journalists. It’s a tipping point for technology and broadcasting. It’s also a tipping for us politically as a nation," she said. But these technologies, according to Ms. Ressa, "are just like an icing. In the end, it’s still the hard-core reporting, it’s the content, it’s going to be the context." She also mentioned, "Our ’patrollers’ are not professional journalists so they won’t be able to tell the stories the way that we do. So, we always have a job, I’d like to think. But they [patrollers] will deliver faster because they’re in their community." Ms. Ressa said that even after the elections, they will continue to encourage citizen journalism. "We will go back to ’Bayan Mo, i-Patrol Mo.’ I think we look at it as a continuum. You know, from 2005 until now, citizen journalists are here to stay." ON BIASED REPORTING. During the campaign period, many have accused ABS-CBN of being biased when it comes to election-related reporting. So, PEP (Philippine Entertainment Portal) took the opportunity to clarify this issue during the press visit. "We’re just not giving them what they want to hear about themselves," defended Ms. Ressa. "I can tell you that the facts speak for themselves. First, every single political party has accused us as biased. So, I keep on saying that if they all accuse us of being biased, that must mean we’re not biased." To back it up, she pointed out recent studies done by an independent media monitoring group, the Center for Media Freedom and Responsibility (CMFR). "They took the number of stories we have. We did more stories on election than our competitor, which means more people can get angry. CMFR said there’s no bias. An independent group has said that," Ms. Ressa stressed. Ms. Ressa also said that they’re not affected by this label. Instead, their group tries to focus on delivering fair and accurate news to public. "I can tell that we’re focused on the future and we’re fighting the battle, at least in terms of the coverage," she stated. Catch the ABS-CBN Halalan 2010 Coverage this Sunday, May 9, on DZMM-TeleRadyo starting at 10 p.m; and on May 10 on ANC starting starting at 4 a.m.; ABS-CBN Channel 2 starting at 5 a.m.; and Studio 23 simulcasts ANC at 7 a.m.